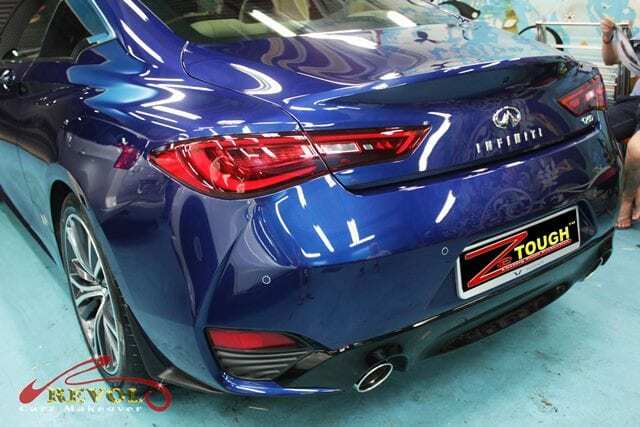 Daring curves, deep creases, intensified low, wide powerful stance…The diamond-blue Infiniti Q60 Sports Coupe nails the exterior look with the dynamic ZeTough Ceramic Paint Protection coating at Revol Carz Makeover. The 2017 Infiniti has been reworked at every angle into a striking shape inside and outside. 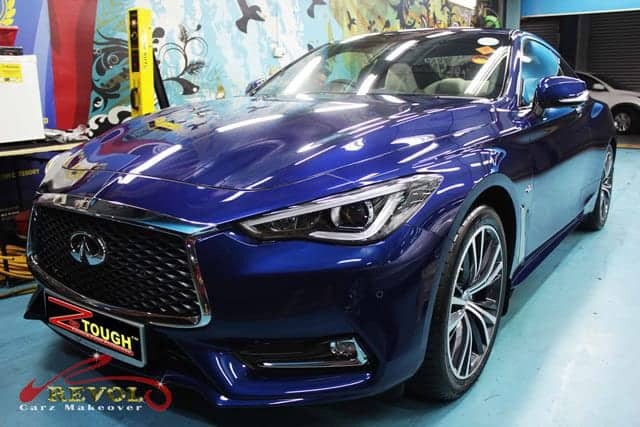 The gorgeous Q60 coupe comes standard with 19-inch alloy wheels, LED headlights, keyless ignition, leather power adjustable front seats, leather-wrapped steering wheel, dual touch screens and review camera. 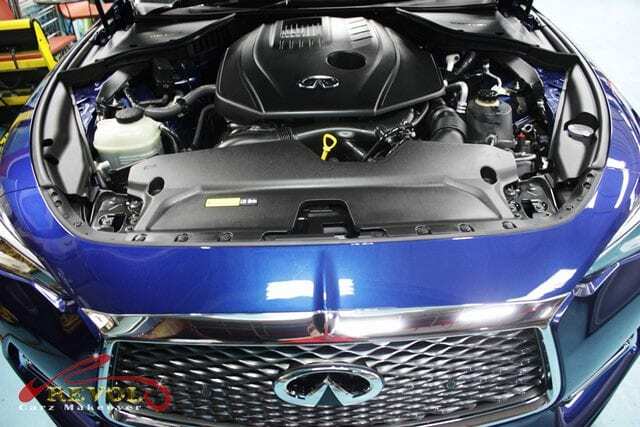 Under the hood, the Q60 sports a 2.0-liter turbo-4 engine powered with 208 horsepower and 258 pound/feet of torque that hauls the coupe from zero to 100km/h in 7.3 seconds. Infiniti never fails to impress at first sight. The gleaming diamond-blue Infiniti Q60 after a professional grooming with ZeTough Ceramic Paint Protection Coating. Just below the enlarged grille, the lines from its lower front fascia ascend through the Infiniti badge. The angry squinting eyes that double as LED running lights look menacing. The intensively polished “eye-inspired” LED headlights give a provocative stare. The interior decked with white leather seats? No problem. Our professional detailing works can successfully restore any leather to look sharp and new again. Please remove your shoes before getting into the car. The 2017 Infiniti Q60 is lavishly equipped with premium leather and thoughtful interior appointments. Also electrically powered is the steering column adjustment for the nice and thick leather-wrapped three-spoke wheel. We made an impression with the perfectly cleaned interior. The power heated outside mirrors with integrated LED turn signals. Notice the awesome wet look? Thanks to the long-lasting ZeTough Ceramic Paint Protection coating. The effect is astonishing after the ZeTough Ceramic Paint Protection coating is fully cured. The Q60 keeps the same short deck lid and a small lip spoiler casts a small shadow over the rear Infiniti badge. The chrome tail-pipes were repeatedly cleaned and polish for perfection. The fully restored 19-inch wheels complete the incredible makeover to a better-than-showroom condition. Have you given your car any reliable paint protection coating yet? Perhaps you are contemplating giving your car a new lease of lift. With the proven coating of the Eco-friendly ZeTough Ceramic Paint Protection coating, we guarantee your car’s paintwork gets unparalleled protection with the guaranteed showroom shine throughout your ownership. Maintenance after the coating is minimal. White is purity, uncorrupt and supremacy. White shows you have impeccable standards. 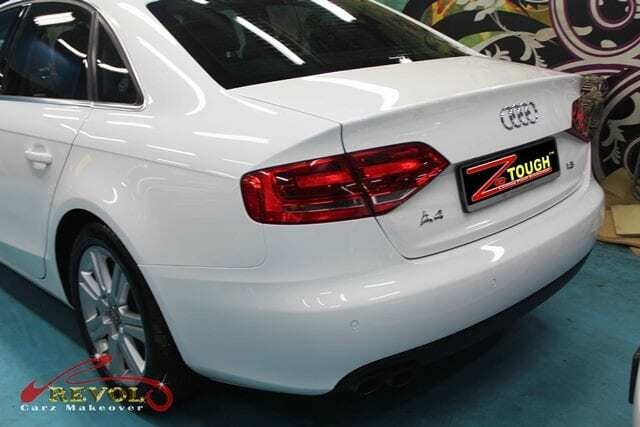 It is not a surprise that the owner of the Audi A4 had chosen the same white for repainting his car at Revol Carz Makeover. For not so new cars with white coloured paintwork and without a reliable paint protection, they are likely to turn off white and ‘yellowish’ over time. Having the car resprayed together with ZeTough Ceramic Paint Protection Coating will retain its original paintwork and achieving a brand new showroom look. 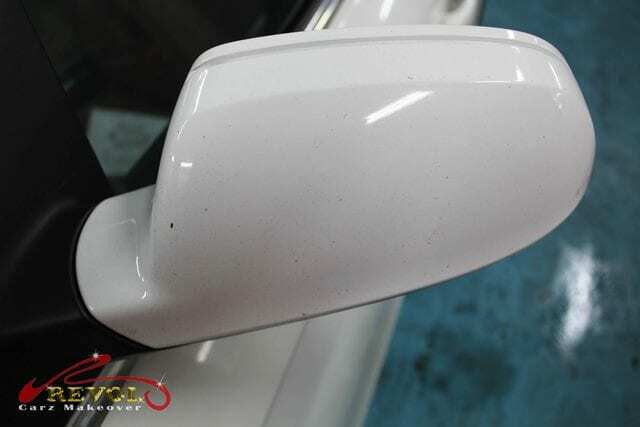 While our painters match the paint color code precisely, another team prepared to carefully strip parts of the car like the side mirrors, body kits, bumpers, headlamps, tail-lights, door trims etc. The car then goes for a good cleaning job, sanding and priming before moving to the next stop for spray painting. The new Audi A4 for 2016 is bigger and lighter and more refined improvements. 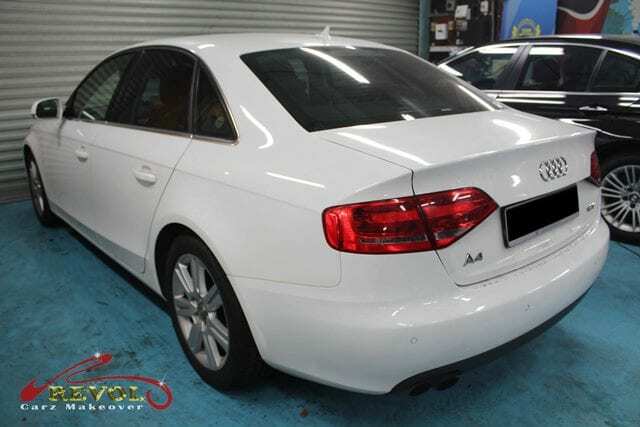 The body panel has been redesigned, yet you can tell instantly that it’s an Audi A4. The completely new engine powered-up 1.8T accelerates to 100km/h in 8.3 seconds, and does so via a continuously variable transmission. Enjoy viewing our website and discover how we had incredibly transformed the Audi A4 1.8T to her better-than-show glory. Thanks to the unrivaled ZeTough Ceramic Paint Protection coating. 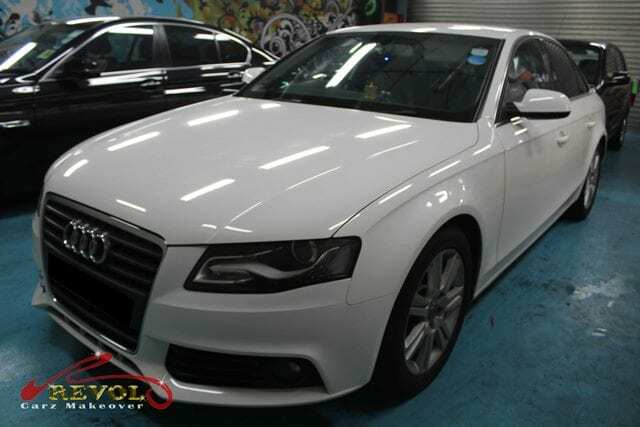 The Audi A4 1.8T arrived at our workshop with the foggy-looking body paintwork. It needed the same color full re-painting and a paint surface coating to restore its former glory. Before painting, the dents and scratches on the car surfaces are being restored. BEFORE – We stripped the wheels, bumpers, tail-lights and headlights before painting. BEFORE – The front end received a lot of attention as well. The familiar Audi hexagonal grille is to be removed; so are the wheels and bumper. Audi headlights with internal bulb shapes mirroring the car’s angular design aesthetic are in the process of restoration and buffing. Cleaning, polishing and restoring the engine compartment are thrilling but delicate jobs. 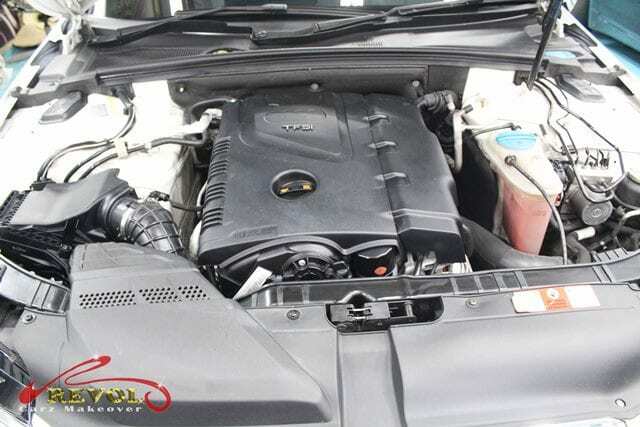 The new 1.8T engine accelerates to 100km/h in 8.3 second via a CVT transmission. Bringing the interior back to life is our restorers pet assignment. Every nook and corner is passionately cleaned, polished, and sanitized. The leathers are further nourished and conditioned. AFTER – the spray painting is fully oven-cured, we moved the car to the next department for ZeTough Ceramic Paint Protection coating. AFTER – The final stage of the full car re-painting with the ZeTough Ceramic Paint Protection coating cured and reflecting an incredible better-than-showroom glory. The wing mirror in “before” condition. 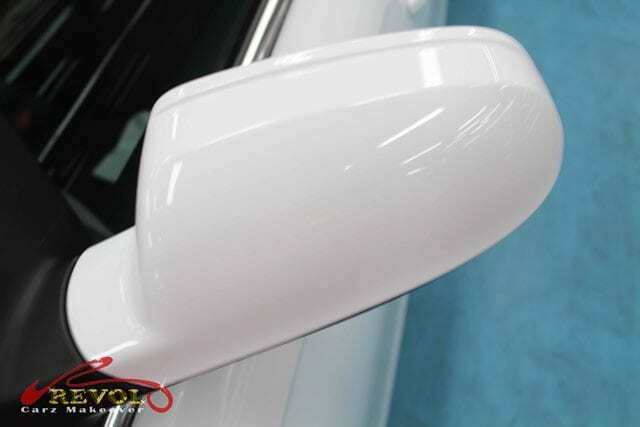 Take a close-up scrutiny of re-painted wing mirror after the application of ZeTough Ceramic Paint Protection. 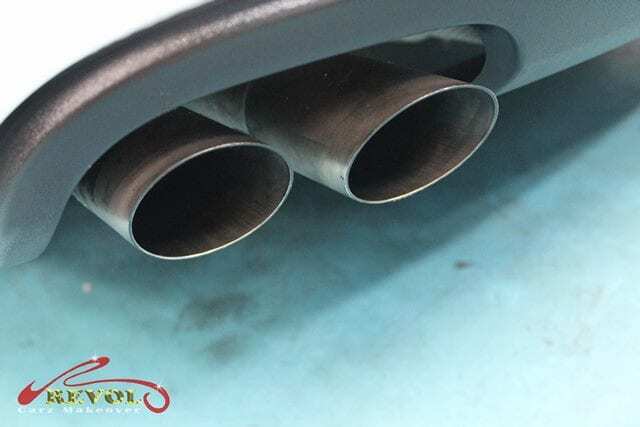 BEFORE – The weathered chromed exhaust tailpipes will be polished to sparkling new condition. BEFORE – The wheels covered with brake dust and scratches. 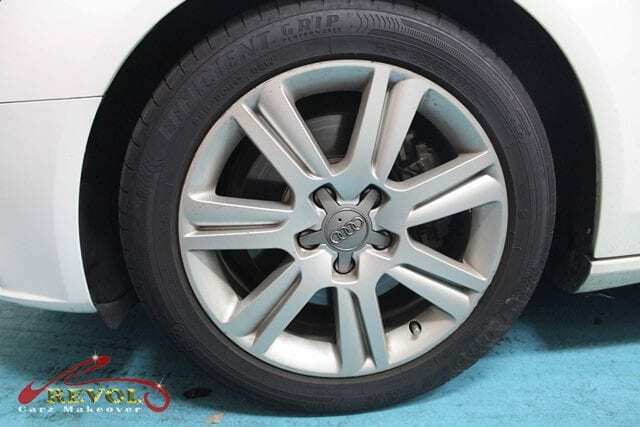 AFTER – The wheels were removed to clean the wheel wells, the alloy rim restored and polished to achieve this new condition. With the coating of the unrivaled ZeTough Ceramic Paint Protection, we guarantee your car’s paintwork gets maximum protection with better-than-showroom shine throughout your ownership. On white cars, the coating remains super resistant to yellowing. Maintenance after the coating is minimal. The newest member of the Audi family has just arrived at Revol Carz Makeover for a good reason…to preserve and protect its original paintwork all for the future. 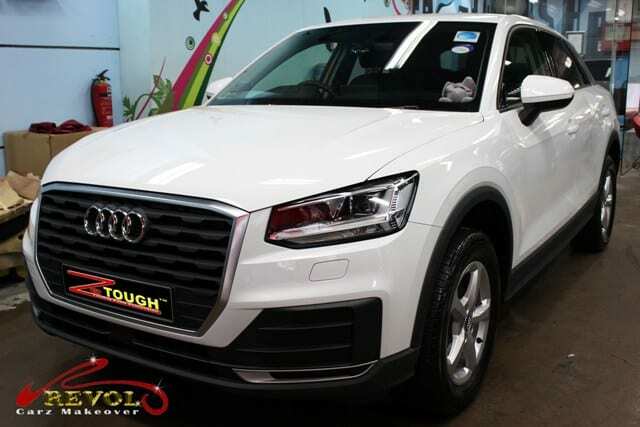 The Q2 1.0 TFSI S Tronic Turbo SUV costs a whopping almost SGD 140,000 in Singapore ( based on the current COE) and it makes a great deal of prudent sense to preserve the car in its immaculate shape for the next good ten years and beyond. 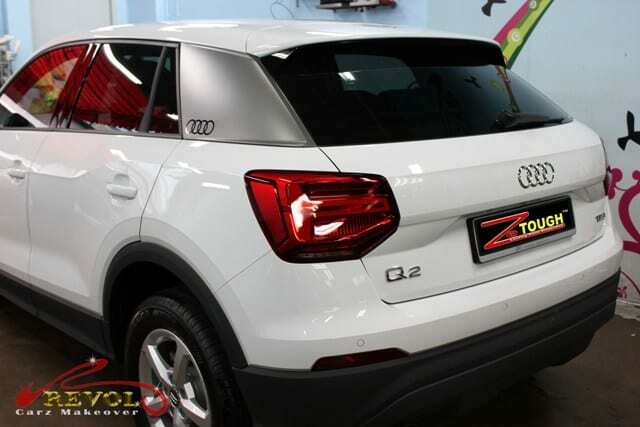 The Audi Q2 exhibits a profound distinct character. The front receives a single-frame grille in octagonal design with the large air inlets. The eye-catching low roof descends and merges into the C-Pillars with color offset blades that accentuates sportiness of the Q2. Pop up the hood and a cheeky three-cylinder, 999cc, 200 Nm torque, turbo-charged petrol engine greets you like an eager beaver. Mated to a 7-speed (A) S-tronic transmission, the Q2 reaches a top speed of 197 km/h and scoring the 0-100 km/h dash in 10.3 seconds. 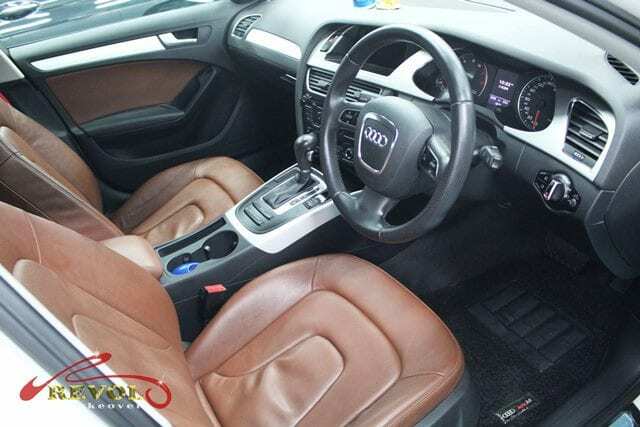 Inside the Audi, quality interior is beautifully crafted. Standard in the Audi Q2 is a 5.8 inch MMI screen positioned above the instrument panel. The infotainment system is operated by a rotary/push button control. 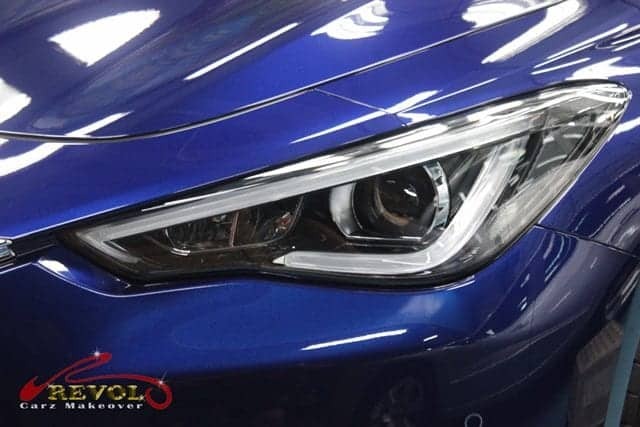 We hope you are intrigued by the following pictures posted to show you what Revol Carz Makeover is not only about making the car shines but much beyond that, our award-winning, ZeTough Ceramic Paint Protection guarantees a long lasting protection and building trust and long term friendship. 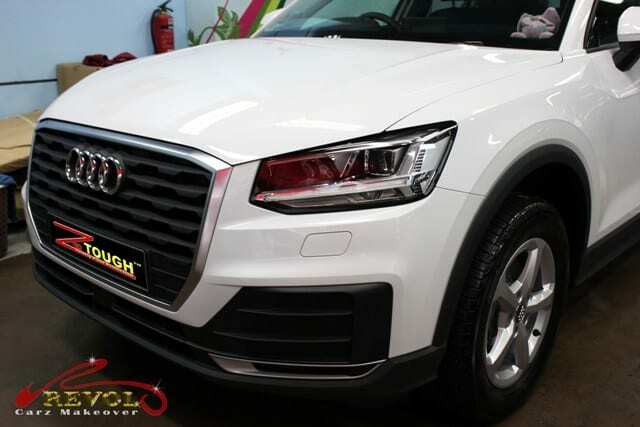 The Audi Q2 in brilliant white sitting majestically ready for collection at after ZeTough Ceramic Paint Protection coating.. The eye-catching low roof descends and merges into the C-Pillars with color offset blades that accentuates sportiness of the Q2. The Audi Q2’s body and design exhibit a very distinct character. The front receives a single-frame grille in octagonal design with the large air inlets. The LED headlamps have been coated for a crystal clear new look. Pop the hood and awe at the absolute cleaned three-cylinder, 999cc, 200 Nm torque, turbo-charged petrol engine after cleaning and polishing. Mated to a 7-speed (A) S-tronic transmission, the Q2 reaches a top speed of 197 km/h and scoring the 0-100 km/h dash in 10.3 seconds. Detailing the beautifully crafted interior is the favorite part of our makeover job. All the leather trims are cleaned and nourished. 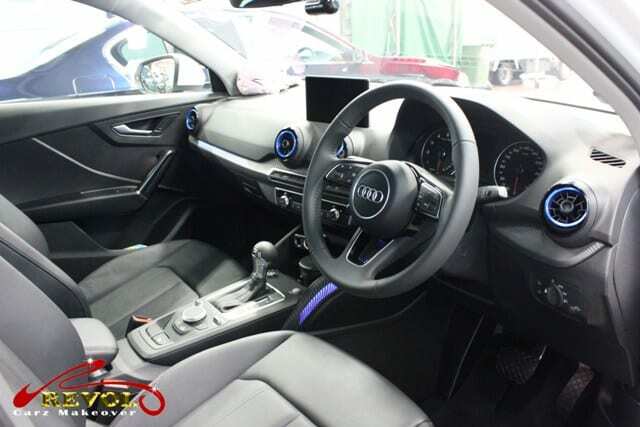 Step inside and feel the aura of the freshened new car. The instrument cluster looks much brighter after our special cleaning and polishing. A close-up shot of the wing mirrors to flaunt the deep gloss and real effect of the ZeTough Ceramic Paint Protection coating. No need for touch up or repaint. The door handles are protected and free of future finger nails and ring scratches after the diamond-hard ZeTough Ceramic Paint Protection is cured. The rear body terminates in a dynamic way with a long roof edge spoiler and a diffuser that has an under body-protection look. You just can’t take your eyes off her after the ZeTough Ceramic Paint protection coating, can you? The tail-lamps come to life like a red ruby after careful hand-polishing. The exhaust tail pipe looks brand new after it has been passionately cleaned to perfection. 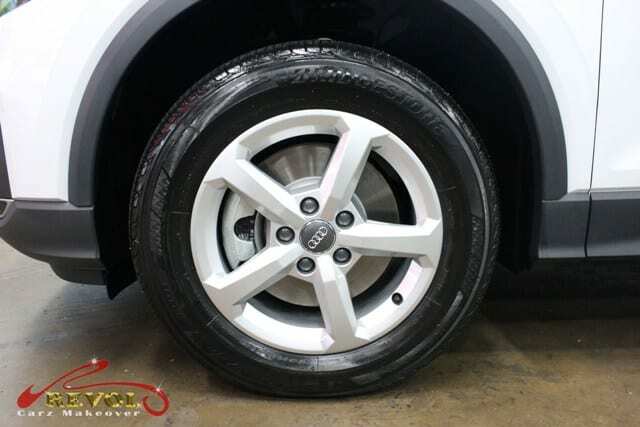 The finale of the Revol Makeover is to ensure that every inch of the wheel is free of dirt and brake dusts. The aluminum wheels have been further polished for a glossy finishing. 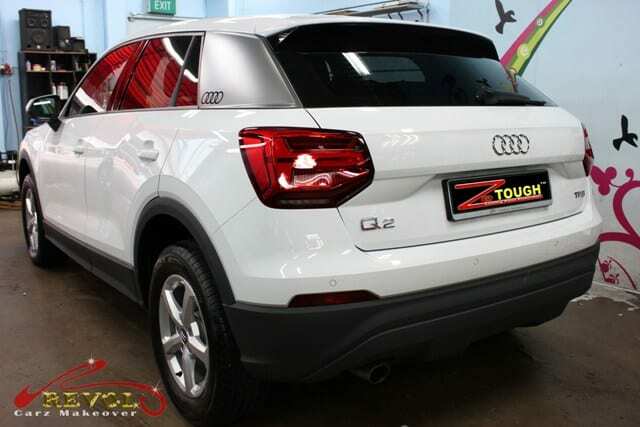 ZeTough Ceramic Paint Protection coating guarantees the Audi Q2’s body paintwork is protected and lasts through the car-ownership. Maintenance after ZeTough coating is minimal. Considering giving your car a Revol Makeover for a long lasting protection? We can transform your car to an immaculate showroom condition too! Happy 52nd National Day Singapore! Cheers to the 52nd Years of Independence!